There really is nothing like the glory of changing weather conditions for sprinkling fairy dust on a Grand Prix. A shot of rain on a cool day was enough to turn the tedium of the Hungaroring into a sparkling race to remember. It also didn’t hurt to have the sultan of capricious weather on the grid, hungry for a win. Warning: spoilers. It has taken me years of living in Budapest to realize that the Common Fig (Ficus carica) can not only survive but actually bear fruit in this city, which is farther north than Duluth, Minnesota. While the radically different orographies of Europe and North America may make such comparisons moot, I still find it remarkable that a tree so Mediterranean in character can flourish halfway to Scandinavia. In fact, certain specimens planted on the sunny southwestern faces of Budapest’s western hills bear fruit as early as mid-July. What is good, however, for the Hungarian fig harvest—long, dry, hot summers—is terrible for the Hungarian Grand Prix. The event is usually held at the end of July or early August, when the weather tends to reach for the triple digits of baking Continental hell with no chance of rain. Combine that with the Hungaroring, a track whose geographically inherent dustiness is compounded by the scarce use it sees apart from the Grand Prix weekend. This reduces the possible number of racing lines to one, and that on a twisty track with very few straights. This is how you end up with the typical Hungarian Grand Prix, a slow, boring procession with very few overtakes. The only high point tends to be the hopeless struggle of the British commentators trying to pronounce the names of the random Hungarian dignitaries giving out the awards at the end. But the 2011 edition was not a typical Hungarian Grand Prix. Save for a few days of high heat in mid-July, it’s been a cold, rainy summer here—so cold that I was actually eyeing a pair of heavy Harris Tweed trousers in my closet one morning, feeling completely ridiculous for doing so on a July day. As Formula One left the equally cold and rainy Nürburgring a week ago, the signs were pointing to a cold and rainy Hungarian Grand Prix, also known as Jenson Button weather, who took his first win at the 2006 Hungarian Grand Prix—Honda’s last—in similar conditions. Button has a thing for changing conditions. It may be a result of his father not buying him rain tires for his gokart when he was a kid—as he’s claimed—or his unusual intelligence, but whatever the case, if it’s raining then not raining then raining again and Jenson Button is in an even mildly competitive car, one can count on him shooting for the win. he builds up a 2–3 second lead by the end of the first lap, the McLarens remained close by. He was passed first by Hamilton, then by Button, who peppered the entire race with many entertaining McLaren-on-McLaren passing. Behind them, both Mercedes cars made great starts, Nico Rosberg and Michael Schumacher getting up to 4th and 5th, followed by the Ferraris and Mark Webber’s Red Bull. With no more rain and the speeding cars on intermediate tires sucking the water off the racing line, the next act was pitting for slicks. Mark Webber was first, and he appeared to have jumped the gun, sliding around wildly on his supersoft tires in the first few corners, but it turned out to be the right call, and the leaders followed him into the pits. Rosberg and Schumacher dropped down the field, the Ferraris moved ahead, and up front, Hamilton, Button, and Vettel remained in the lead. light on his tires, a plan began to emerge. He was going to go to the end of the race on the soft tires. The only way Hamilton could have won the race at this point was to have extended his lead of 7 seconds into a pitstop’s worth, around 20 seconds. This he could not do. In fact, Button started gaining on him. Hamilton, his supersoft tires increasingly worn, spun out at the turn 8–9 chicane. Button was right on his tail. Then a light shower began. Because Hamilton was still in the lead, he was first into the pits for intermediates. Wrong call. The rain didn’t last, Button was in the lead on his soft slicks, and he would not pit. Hamilton’s day was further wrecked when the stewards ruled that his on-track recovery after his spin forced Force India’s Paul di Resta—who would finish 7th, his best result—off the track, and he was given a drive-through penalty. After another pitstop for slicks. He emerged sixth, but Hamilton being Hamilton, he fought back, overtook Massa and Webber, and salvaged a 4th place finish to remain 3rd in the championship. But by then it was Jenson Button’s race, with Sebastian Vettel a comfortable second and Fernando Alonso a comfortable third, running on similar tire strategies. Button was not going to make a mistake at this point. It was a beautiful race, his 200th, five years after his first win, and he took the 11th victory of his career in the cold Hungarian summer, the cunning master of bizarre weather. Three and a half seconds behind him, Sebastian Vettel arrived second after a terrible day of the Sebastian Vettel variety, which means he’s extended his lead in the championship to a dizzying 85 points: 3 and ⅖ clear wins. The early fall Budapest pastime of gorging on street figs may be shot, but if this is what it takes to provide a memorable and fascinating Hungarian Grand Prix, so be it. Further fireworks were provided, literally, by Renault, where Nick Heidfeld’s car caught fire yet again and even produced a minor explosion. It was also interesting to see that Formula One’s haphazard offensive elements introduced for this season—the movable rear wing, the degrading tires, the KERS system—have mellowed out over the races, which are no longer filled with fake overtakes and fake tire changes to such an extent as in, say, Turkey. This may have to do with the character of the past few races, and the weather, but it’s certainly a welcome development. 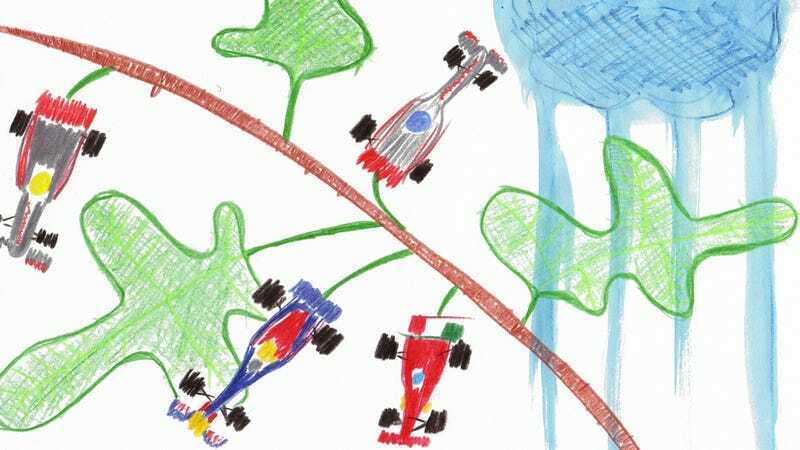 Formula One will retire for its summer break of four weeks now, with the next Grand Prix at Spa-Francorchamps on August 28, a day your humble correspondent will spend driving from Georgia—the country, not the state—to a mountain lake in Armenia, so this Crayola series may take a one-race break too, unless the villages of northeast Armenia provide ways of getting online. We’ll definitely be back for Monza on September 11. Until then, enjoy the summer and enjoy the figs. Illustration by Peter Orosz. Gallery curated by Natalie Polgar. Photography by Mark Thompson/Getty Images, Ker Robertson/Getty Images, Vladimir Rys/Getty Images, Peter Fox/Getty Images and Lars Baron/Getty Images.